Hardly a single important circumstance concerning the recent health, hospitalization, treatment, or the time and immediate cause of death of Sathya Sai Baba, has not been surrounded by secrecy, disinformation and ill-concealed controversy and power struggles between contestants for a role in the multi-billion dollar financed goings-on. This can be seen in a large number of newspaper investigations and statements from involved parties. Considering the huge controversy about his illness, about the amount of drugs he was taking for such a long period (some say 6 months) and the causes and manner of his decease, there should certainly have been a post mortem with a coroner’s report too, but no such process has been allowed. So far there is no mention anywhere of even a death certificate being issued for Sathya Sai Baba – surely a normal practice which is again being abrogated. The Sai Trust officially announced the death of Sai Baba on Easter Sunday, namely the day considered to be the one Jesus supposedly was resurrected on! However, everything that is known about this matter points to Sai Baba having been brain-dead well before he was disconnected from his life support system, which was put in place as the one vital organ after the other failed completely. The obvious uncertainty, anxiety and disagreements between doctors, insider VIP office-bearers (i.e. only Indians) caused an almost total breakdown of communication between them, Sai Baba's family members and the mass of devotees. While bulletins were uninformative, his doctors and cagey spokespeople were still insisting that he was improving, that his chances of recovery were better etc… Sai authorities were secretly ordering an embalming coffin (on April 4th 2011) That was 20 days before the date they chose to announce his decease (April 24th). The chosen day was thought auspicious, suggesting identity with Christ (who Sai Baba said had been his chosen Son) and with divine resurrection. So the political dignitaries and famous endorsers of SB were alerted days in advance, while aircraft and helicopters were reserved, itineraries planned and very considerably security police and even military units were summoned and some deployed in advance of the day of the funeral directly after his death! What could be more transparent evidence of connivance and trickery about his actual death! 1. Kumar International, Malleswaram, Bangalore, who are specialists in embalming/casket/undertaker funeral services got a request on or around the 29th March, for a special casket. 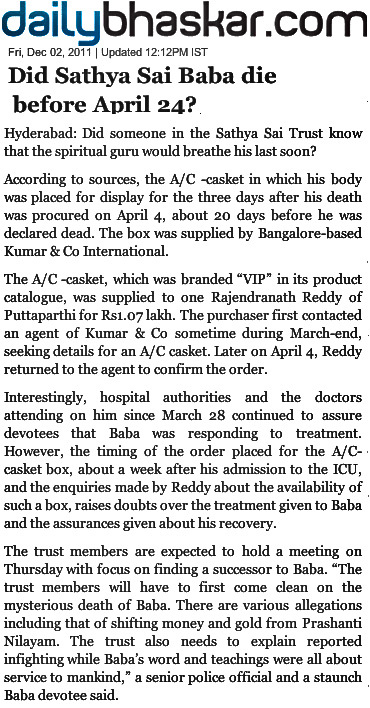 The caller was one "Rajendra Reddy"...and he wanted to buy an air conditioned casket with embalming facility. 3. The price quoted was Rs 57,000 plus Rs 5700 for transportation, the caller first said it should be delivered to Coimbatore city, and then said Mysore later. The price and details were sent by Kumar International by email to "Rajendra Reddy"....who asked how long it would take to make one. 4. RR was informed it may take minimum a week , as per the specifications he had given, or alternatively, he could take a look at what they had in store. RR said he needed one within 3-4 days and had no time. He also asked how long the body would be preserved, to which Ms Lakshmi had said " about 8-10 days, depending on the diseases/medication the deceased had been receiving. She was also asked about formaldehyde and she had replied that the doctors would be able to advise better, but yes, formaldehyde would be a good option. 6. Lakshmi's staff started getting frantic phone calls by 3 AM on April 4th/5th....they had sent a complete price quotation for the special casket chosen by 4.41 pm April 4th ( the email was shown on TV ). 7. The casket was asked to be delivered to Puttaparthi hospital, which Lakshmi's service did immediately. 9. But as nothing developed, she put it out of her mind...till Sai Baba was announced dead on April 24th morning. 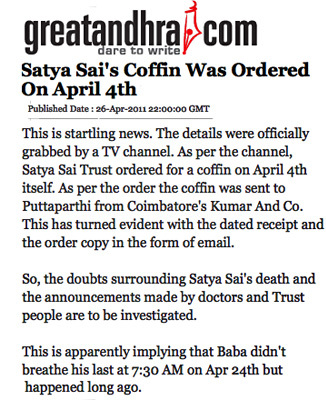 And by evening 6pm, when she saw the coffin/casket on TV, she was shocked to see it was the one she had sold and delivered to Puttaparthi on April 4th/5th. Even the name "Kumar International " with contact numbers on the casket was seen on TV ( after the burial today morning, when the casket was kept to one side)...but even by Monday ( 25th) she was so concerned about what she should do, she consulted her family guruji and appraised him of the situation, and that this may involve the powerful Sai Baba.. The guruji simply asked her not to be afraid and advised her to speak the truth , irrespective of what it involved, as truth was the greatest protector. 10. Lakshmi, called TV channels in Andhra and went live on air, telling her full story, along with complete records to back up everything.